The goal of the book is to let you be familiar with black and white media, to draw and have fun. Exercises are simple and easy to follow along. Different drawing techniques are taught, and you'll also get to create art using different tools. Other than drawing with pen, there are also exercises with markers, brush and even cutting paper. This is a fun drawing book for beginners. No knowledge of drawing is required. The examples all look pretty simple. There aren't any highly detailed or exquisite pieces of work. Even so for more detailed pieces, hence beginners should not find it daunting to follow along. You get to learn to loosen up, switch between drawing with positive and negative methods. Right at the back of the book are different toned coloured paper that you can draw on. I'm glad they did not include any white pages because you can find those easily on your own. Oh, you do need to get some white gel pens, markers or paint in order to follow along the lessons. 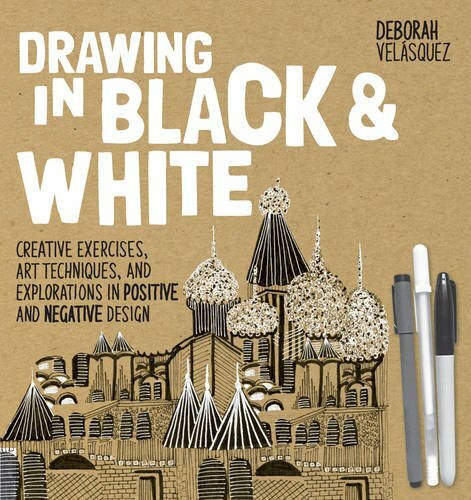 It's a fun activity book for those who want to dabble with art. If you like this book, I recommend Just Draw It! and Just Paint It!. To explore more pen and ink, check out Pen & Ink: Contemporary Artists, Timeless Techniques.